Leptospermum laevigatum is known as the Coast Tea Tree and is a medium to tall shrub or small tree reaching a height of eight metres. The trunk is often gnarled, the bark flaky and shed in strips. Leaves are lanceolate, grey-green to green with a sharp point. The flowers are two centimetres across, white, conspicuous and appear from August to October. 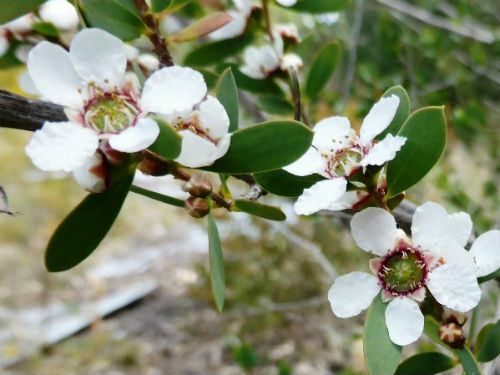 Leptospermum laevigatum is widely distributed in coastal areas of New South Wales, Victoria and Tasmania. In many coastal areas of New South Wales the Coast Tea Tree is the dominant shrub. The Coast Tea Tree has become a weed in South Australia, Western Australia as well as South Africa probably from garden escapes. Perhaps this species should not be planted in coastal areas outside its natural range. There appears to be no weed potential in non-coastal areas. In areas where there is no potential for bushland invasion Leptospermum laevigatum could be cultivated in hedges. The species was recorded as growing in Melbourne Botanic Gardens in 1858. Leptospermum laevigatum is also planted along the Central Coast of California to stabilize sand where it is known as the Australian Tea Tree. The species name is from the Latin and means smooth and shiny. This probably refers to the appearance of the species.